There is still just about time for you to write to your MP to encourage them to support The Times's Cities Safe for Cycling campaign by asking them to sign Early Day Motion 2689 and attend the debate on 23 February. MPs do tend to take notice if they receive more than a few letters from different constituents on the same topic, particularly if they are individually-composed. The easiest way to write to your MP is to use this form. Here is my letter to Barry Gardiner, MP for Brent North, making some points specific to his constituency. I'll tell you if I receive a response. I would like to strongly encourage you to sign EDM 2689 supporting The Times's "Cities fit for cycling" campaign. I would also be very grateful if would would be able to find the time to attend the debate on cycle safety in Westminster Hall scheduled for 23 February. I feel this is an incredibly important subject for the people and economy of Brent. Cycling could and should be an obvious method of making short journeys in Brent for a wide spectrum of people. It is cheap, efficient, and non-polluting. More cycling would reduce congestion, noise, pollution, and pressure on public transport, and help local shops and local economies, as well as improving public health, through giving people an easy way to exercise, and increasing the independence of children, and others who cannot drive. Yet cycling in North Brent is seriously held back by the state of our road network and a general lack of safe cycle infrastructure. To most people, cycling feels far too dangerous for them to contemplate in North Brent. Our major through-roads are hostile to cycling, with virtually no cycle lanes, or very badly-designed ones. They pass through unavoidable junctions (such as the particularly bad examples at Staples corner, on the A5, and Neasden, on the A4140), designed purely for speed and throughput of motor traffic, that present a level of danger that puts off all but the most determined cyclists. 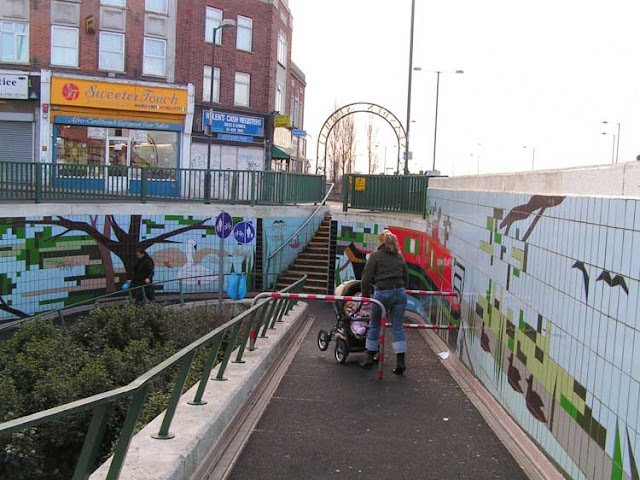 Where alternative routes for cyclists have been provided, as at Neasden town centre (the shared cycling-pedestrian underpass), they are poor adaptations of unsuitable existing 1960s-70s infrastructure that give cyclists inefficient (and still dangerous) journeys, and introduce unnecessary conflict with pedestrians. Brent Council is aware of many of these problems, but, like other local authorities, simply does not have the funds, nor the necessary guidance from central government, to make the scale of changes that would be required to make our roads attractive for cycling. This is why the parliamentary debate on The Times “Cities safe for cycling” manifesto is so important. That manifesto calls for a serious level of funding for cycling infrastructure (2% of the Highways Agency budget), redesign of dangerous junctions, and other necessary measures to make urban areas like Brent into attractive cycling environments for all types of people. People in North Brent want to cycle, I am certain, but most do not feel they have that choice, because of the perceived and actual danger of our roads. I am not very old, yet I can recall a time when British children commonly cycled to school. Only 0.5% of journeys to Brent schools are now made by bicycle, a shocking statistic. I would like to see government policies that start to turn this situation around, so I would like you to support The Times campaign.